One of my favorite things about fall is the abundance of beautiful leaves. They provide hours of entertainment. Bobby has had fun raking them into huge piles; then, running through the pile and lastly tossing the remnants of the pile into the air. 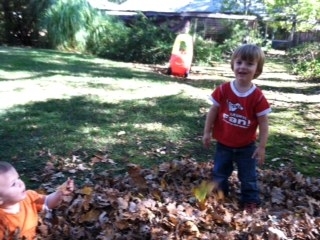 Of course, CJ has been part of the action too by crawling through the piles. Living amongst trees provides not only rambunctious activities but also crafty ones as well. After collecting a few special leaves, Bobby and I have made impressions in salt-dough, centerpieces and paintings. My favorite project so far has been the classic leaf print. It’s easy, fast and provides lots of creative fun. 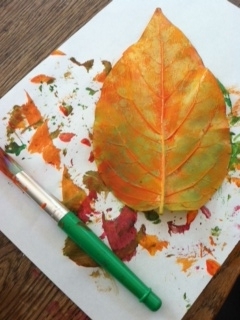 All you need to do is gather a few leaves, paints, brushes and paper. 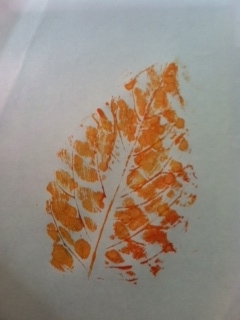 Paint the leaf and then press the painted leaf on a blank paper. Remove it carefully and let it dry. Voila, a beautiful autumn decoration t o cherish for years to come. Make extras to send along to family or to bring with you as a hostess gift on Thanksgiving. This entry was posted in crafts, fall, Uncategorized and tagged art projects, crafts, fall art projects on November 12, 2012 by Modern Mama.